Known for its coworking spaces across country and overseas, New York–based WeWork on Monday said in an e-mail statement sent to Xconomy it had partnered up with developers and the city’s administration to occupy a large chunk of a 675,000-square-foot building to be constructed at the Brooklyn Navy Yard. There are already lots of coworking spaces available in the New York metro area—such as Work Better, AlleyNYC, Work-Bench, The Yard, and Impact Hub NYC—all vying for the attention of startups growing here. PivotDesk helps startups find shared office space. In recent years, there has also been a little bit of churn in this sector, with Dogpatch Labs shutting its New York location in 2013, along with its Palo Alto, CA site. Regardless, WeWork and the folks of Brooklyn seemed to see a need for even more room for startups. Collaborating with Rudin Development, Boston Properties, and the Brooklyn Navy Yard Development Corp., WeWork said it will lease and occupy 222,000 sq. ft. in the forthcoming $380 million building. Construction on the site, called Dock 72, along the East River is due to start later this year, WeWork said, with tenants expected to move in starting in 2017. WeWork said this project is being billed by the city’s administration as part of the overall redevelopment of the Brooklyn Navy Yard—with new manufacturing, light industrial, and retail space. Moreover the participation of WeWork is aimed at the startup community growing in this part of New York, which is home to the likes of MakerBot Industries and Etsy, which raised $267 million when it went public in April. 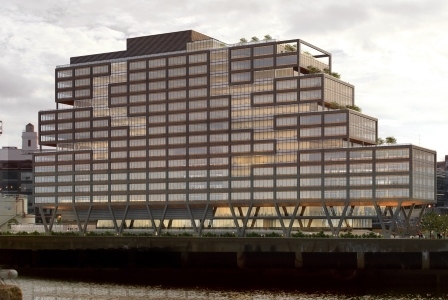 Dock 72 will be largely commercial space, WeWork said, with WeWork anchoring the property. WeWork already operates 16 locations across the city, including one in Brooklyn called DUMBO Heights. In addition to being a key tenant, WeWork said it will have some input on amenities for the property, such as curating some food and beverage offerings and the conference center on the rooftop.